I learned last night that the mendaciously named Roman Catholic front group called Stand Up For Religious Freedom was planning a demonstration the next day in San Francisco against the federal policy requiring groups accepting federal funding to offer reproductive (and counter-reproductive) services in their health plans. By the byzantine twisted logic we’ve come to adore in the Roman Catholic Church, they call it an infringement on their religious freedom to not be able to force non-Catholics in their employ to follow Roman Catholic religious rules. Since when does religious freedom include the right to force others to obey the rules of your church? I guess all leaps of faith like that are easy once you’ve swallowed transubstantiation and can no longer trust your senses of sight, smell, taste, and touch….much less reason. Me, i think alligator tastes better. So i thought, sure, i’ll join the counter-demonstrators, and so early this morning i started making my plans for the day. I even went so far as to print out a sign to wave and taped it onto a cardboard backing for improved brandishment. And then went ahead and double checked the demonstration location and threw a library book in my pack to return on the way. And since i wanted to be there in plenty of time, decided it would be a good day to pick up a Deluxe Burger at Pearl’s Deluxe so i could nibble it while the demonstrators and counter-demonstrators gathered. Well, if “nibble” could be used to accurately describe consuming a Deluxe Burger. Stopped at the gym on the way because i wouldn’t want to die in a hail of police bullets unbuffed, returned my book, grabbed the burger, and Segwayed up to the site ten minutes early. The only people present were folks on the sidewalk walking purposefully toward lunch. Hmmm. So i sat on a bench eating my hamburger wondering whether i could possibly have not looked closely enough at the address to see that it was on Ninth Avenue instead of Ninth Street? Decided that must be it and came home. Started working on the flat of raspberries i picked up yesterday from the Ortiz boys, and then it struck me. Today’s Thursday. Meanwhile, more How Green Art Thou? evidence in San Francisco. 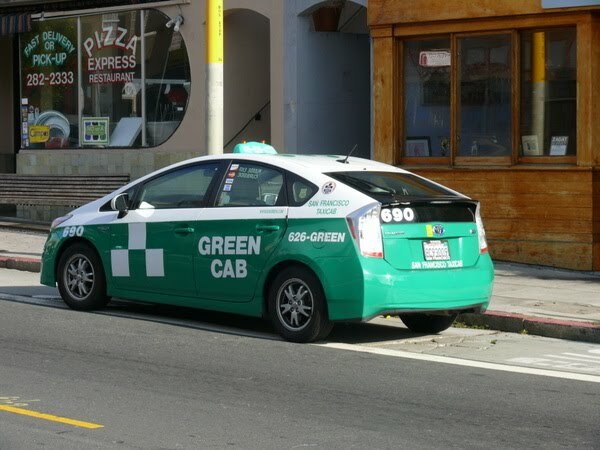 Priuses are becoming a larger and larger percentage of the cabs in the city now. Stands to reason. Tough little cars, the highest gas mileage, and the locals love ’em. And since i’m talking about Priuses, i realized today that there’s a name for the overweening pride that Prius owners take in their vehicles – hybris.